The Pink Panther was the first movie in a series of comedy/mystery films starring Peter Sellers as Inspector Jacques Clouseau. Most of the films were written and directed by Blake Edwards, with theme music composed by Henry Mancini. Elements and characters inspired by the films were adapted into other media, including books, comic books, and animated series. 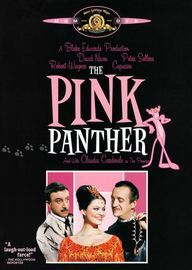 The Pink Panther is a 1963 comedy film directed by Blake Edwards and co-written by Edwards and Maurice Richlin, starring David Niven, Peter Sellers, Robert Wagner, Capucine, and Claudia Cardinale. The film introduced the cartoon character of the same name, in an opening credits sequence animated by DePatie-Freleng Enterprises. As a child in Lugash, Princess Dala receives a gift from her father, the Maharajah: the "Pink Panther," the largest diamond in the world. This huge pink gem has an unusual flaw: looking deeply into the stone, one perceives a tiny discoloration resembling a leaping panther. 20 years later, Dala (now played by Claudia Cardinale) has been forced into exile following her father's death and the subsequent military takeover of her country. The new government declares her precious diamond the property of the people and petitions the World Court to determine ownership. Dala, however, refuses to relinquish it.